BOISE, Ida. 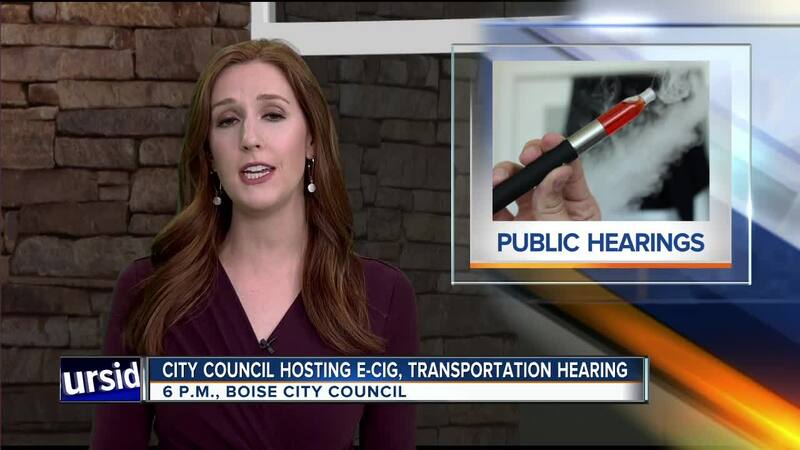 — Boise City Councilors will host two public hearings at its meeting this week, focusing on e-cigarettes and public transportation. The first item is a proposed update of the Smokefree Air Act. The proposed ordinance changes would remove the exemption for e-cigarettes and vaping in public parks and on the Greenbelt. It would also remove exemptions in public places where smoking is prohibited. The Smokefree Air Act was first passed by the Council in 2011. "We now know more about the adverse health impacts these devices have on our citizens and their rising use among young people," says City Council Member Holli Woodings. "I think the time is right to make this change, and I look forward to hearing from residents on this issue." A second public hearing on public transportation and transportation funding is also set for tomorrow. Council President Pro Tem Elaine Clegg says citizens can share their thoughts on transportation funding in a comprehensive way, giving councilors a chance to see what the public wants before they develop a budget workshop proposal. Valley Regional Transit staff will join City of Boise staff to present the current state of the city's support of VRT, as well as needs they're seeing. The community can share their ideas about how and from what sources they'd like to see public transportation funded, what they would like to see added, and how the fund can be used. The hearing is not about specific routes, but comment cards will be available for route discussion. The Boise City Council meeting is set for 6 p.m. on Tuesday, April 16, at the Maryanne Jordan Council Chambers inside Boise City Hall. For more a look at the meeting agenda, click here . More information can be found here . You can also follow the City of Boise on social media: Facebook , Twitter and Instagram .